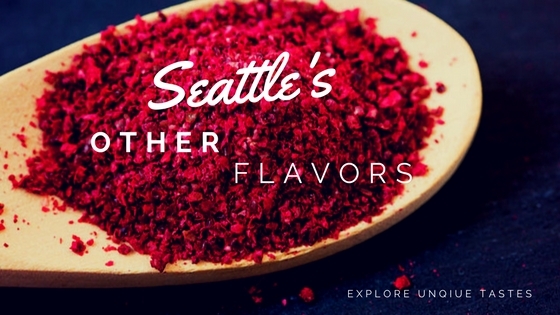 The Other Flavors of Seattle! It’s a wonderful thing to be a foodie in the Pacific Northwest. We are blessed with plenty of fresh ingredients that is accessible through Pike Place Market and regular farmers’ markets in different neighborhoods. Apart from this bounty, one can also find a variety of little shops and restaurants that carry amazing food from all over the globe. One such shop is the Market Spice inside the Pike Place Market. It can easily be overwhelming when one walks in there; all the delightful smells that suddenly surround a person. Many of us have made or bought bread rolls to accompany meat or pasta dishes. For the most part, we all have flavored them with garlic, some fresh and some powdered, cheese, and probably rosemary. The recipe that follows is a little bit of a change by adding some sumac and za’atar. 1. Preheat the oven to 400 degrees and grease a non-stick baking pan or 12-inch cast-iron skillet with olive oil. Be sure to coat all the way up the sides. 2. Roll dough into a rectangular shape and cut equally into 12 strips. 3. Dust with half each of the garlic powder, za’atar, oregano and parsley. Add salt, black pepper and red chili flake to taste. Roll the strips into ropes making sure all the seasoning sticks. 4. Tie a loose knot in each rope and set it into the prepared skillet. Tuck any floppy ends underneath each knot. Repeat for all 12 knots, arranging so they fill the pan. Do not worry if they are not clustered tightly together; that will happen as they proof. Cover the pan with plastic wrap and set it in a warm area. Let rise for about an hour. 5. When the knots are almost finished rising, melt butter in a saucepan or microwave. To the butter, add the remaining garlic powder, za’atar, oregano and parsley and salt, black pepper and red chili flake to taste. Whisk to combine and reserve. 6. When the knots are proofed, remove the plastic. Lightly brush the surface of the knots with the garlic-herb butter. Top with half the grated cheese and bake in a 400-degree oven for 30 minutes or until tops begin to turn golden. 7. Remove knots from oven. Brush again with butter and bake an additional five to ten minutes until brown. 8. Remove knots from oven and brush a third time with the remaining butter. Be sure to get it into all the peaks and valleys; you want the entire surface to be shiny. Top with remaining grated cheese, sumac, and flaky sea salt to taste. Serve immediately with warm tomato sauce for dipping. I hope that this recipe will inspire you to visit Market Spice and bring home some of these flavors. If not, I highly suggest going to these restaurants to enjoy them. Yes, I travel for food…for amazing food. Yes, I might just be a coffee junkie…in constant search of new coffee roasters to fuel myself. Yes, I also love dogs…fine, most dogs! Plan Today for your Seattle Summer Trip! Seattle’s Alki Makes a Great Homebase!